Getting Started: Establishing the team, building the business case; linking corporate, business, finance and workforce strategy; establishing communication plan to engage stakeholders; segmenting the workforce against strategic priorities; reviewing existing data; identifying information gaps; identifying future focused business scenarios. Environment Scan: Environmental scanning is a form of business intelligence. In the context of workforce planning, it is used to identify the set of facts or circumstances that surround a workforce situation or event. Current Workforce Profile: Current State is a profile of the demand and supply factors both internally and externally of the workforce the organization has today. Transition Workforce Profile: demand and supply factors for the transition from current to future workforce. Future Workforce View: Future View is determining the organization’s needs considering the emerging trends and issues identified during the Environment Scanning. Analysis and Targeted Future: Once critical elements are identified through quantitative and qualitative analysis, the future targets that are the best fit in terms of business strategy and is achievable given the surrounding factors (internal/external, supply/demand) are determined. Risk Assessment and Risk Mitigation: The process is about determining appropriate actions to manage risk assessment and identify risk mitigation strategies to deliver the targeted future. 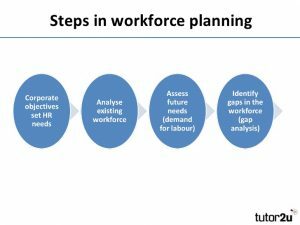 Action plan to embed strategic workforce planning into business planning process.